Brace yourself if you’re a Nairobi commuter because your walking days to the CBD are not quite over yet. This is the latest message from Mike Sonko who has declared that as long as he is Nairobi governor, he will not accept laziness from Nairobians. Speaking during the commissioning of the KCB Foundation 2jiajiri Youth Empowerment Program, Class of 2018 on Thursday, Sonko noted that a walking distance of about 1 kilometre to the Central Business District is not too much to handle. He added that Nairobians must walk in a bid to decongest the city and as a form of exercise, and further described the Monday Matatu CBD ban that left thousands of commuters stranded as a necessary drill. 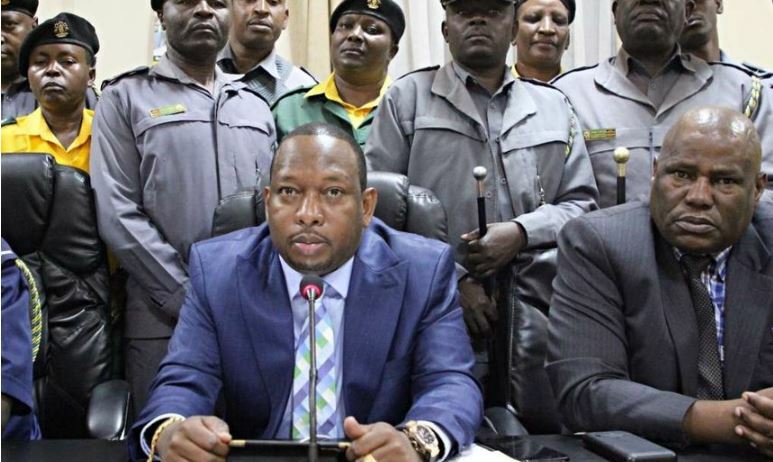 “I’ve seen drills being carried out in airports and malls to prepare against disasters…so I was also just trying it in Nairobi to see..” said Sonko. Sonko also assured that the move to ban matatus in the CBD is not a way to punish the common mwananchi but a means to address the perennial problems facing the transport system in Nairobi. “Walking is exercise and you will still walk again. Even in Rwanda, President Kagame is making people exercise,” he said. The County boss, however, noted that his administration will only cater to the elderly and physically challenged. “We will only look after the pregnant women, elderly and the physically challenged. For the youth, you must walk. From Muthurwa or any bus terminus to the CBD is only 1km…We must be active. As your governor, I will not allow laziness and I want to assure you that you will walk again,” said Sonko. He also called on Senator Sakaja to work with him instead of fighting him in the courts. “Sakaja, I fought former Governor Evans Kidero and even took him to court. But Sonko is not Kidero. Come let us work together,” Sonko said.